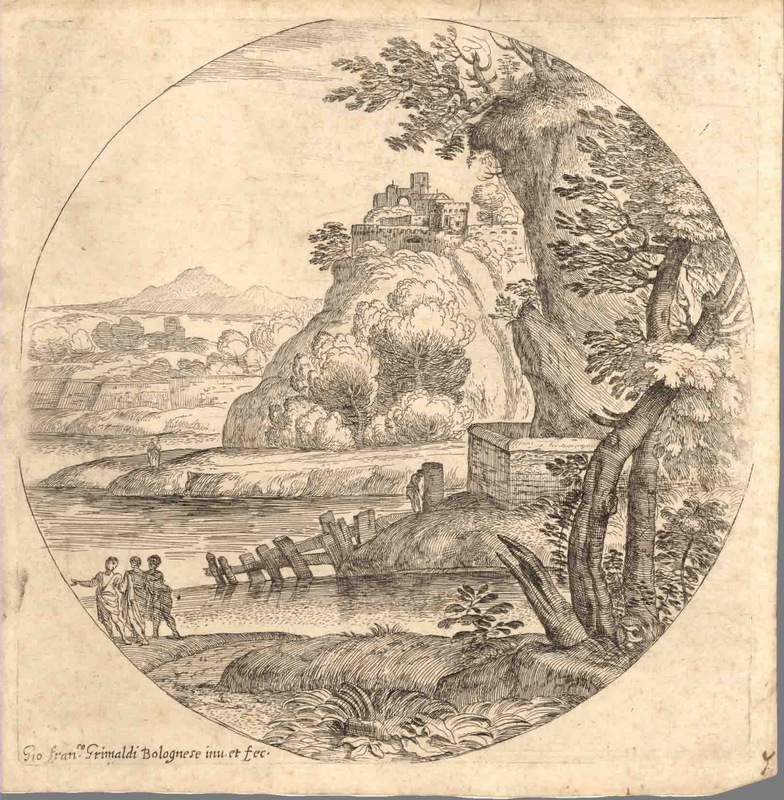 What are some of the 17th century Italian landscape conventions? Over the years I’ve collected a small handful of prints by Giovanni Francesco Grimaldi (1606–80) and his etching, Landscape with Three Men Conversing (c. 1650), epitomises all the elements that I find interesting with regard to 17th century Italian landscape prints. My interest lies mainly with Grimaldi’s use of space but there are other engaging aspects to his imagery and in the following discussion I will address three conventions underpinning his work. Condition: Lifetime impression on laid paper (30mm chain lines). There is light soiling commensurate with age, a 10mm mark (printer’s ink?) on the left, a 5mm tear outside of the plate mark at the top of the sheet and a clipped corner on the bottom right. I am selling this print for $160 AUD including postage and handling to anywhere in the world. Please contact me using the email link at the top of the page if you are interested or clcik the "Buy Now" button. 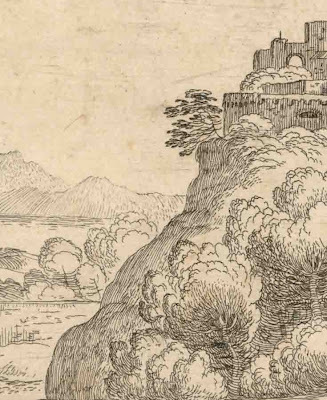 First on my list is one of the more subtle conventions that Grimaldi employs: portraying spatial depth by tonally lightening the landscape behind a featured subject. 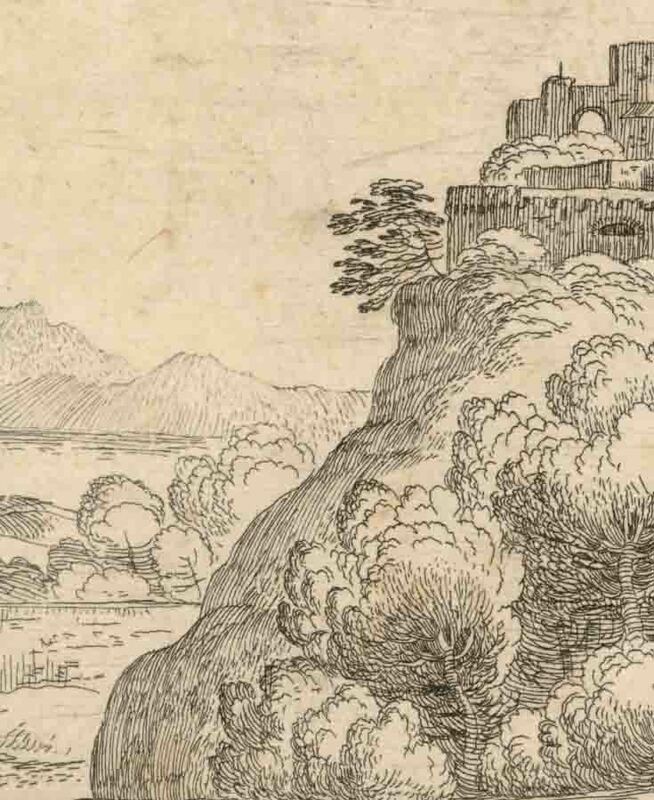 This visual device can be seen where he pictorially bleaches away the landscape immediately behind the mountain shown at the centre of the print. By leaving virtually blank areas of paper, Grimaldi invites the viewer to conceptually “fill in” the blanks abstractly—in the sense of noetic knowledge—with subject matter (see detail below). Second, Grimaldi applies the Baroque convention of linking key features of the landscape with looped and lively rhythms. 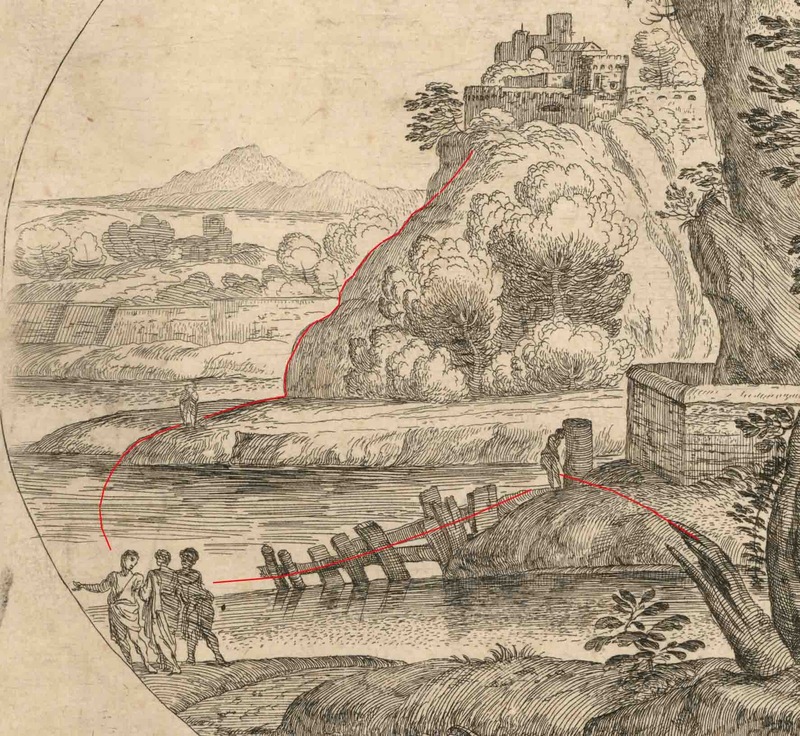 For instance, if a viewer were to examine the image commencing with the shattered remains of a tree trunk at the lower right foreground, the line of this dead trunk points to a figure who appears to be drawing water from a fountain shown near the centre of the composition. From the position of this figure, attention is then diverted towards the left along a wooden palisade to three figures conversing at the lower edge of the circular (tondo) format. Again, another rhythm then leads the eye upwards in a clockwise motion to a figure (or two figures?) standing on the lower reaches of the centre mountain. The same rhythm then follows the silhouette edge of the mountain up to a fortress on the mountain crest. This is only one of the many rhythms that link the important features of the composition together and capture the Baroque spirit behind Grimaldi’s style. Of course the linking of the various features as pictorial stepping stones through the composition is unlikely to be accidental. This brings me to the third convention: the visual language of symbolism. As an example of Grimaldi’s use of symbolism current at his time, the juxtaposition of the dead tree trunk beside the alive and sinuously curving trees in the foreground is an important and often employed vanitas motif in the 17th century. Symbolism also underscores the arrangement of the three conversing figures dressed in classical robes. No doubt for some scholars they represent the Three Graces from mythology. For viewers who do not see this symbolism, however, the arrangement of this group and all the other figures in the composition may have allegorical significance. For example, the relationship of the figures with the signifiers of territorial defences—the palisade and the elevated fortress—may connote the predicament of everyday life with the threat of war.